The Fitnex X Series Velocity training bike is for serious riders. 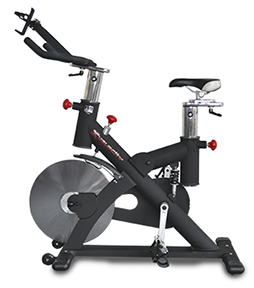 If you normally train outdoors on a road bike and need a solid performer for indoor workouts, the Velocity is a high quality spin bike that is built for long, intense riding sessions. The ultra-durable Fitnex X Series Velocity training bike features a durable leather brake pad, easy to maintain belt-drive system, coil spring suspension, quick-release levers for vertical and horizontal adjustments to the handlebars and seat, stainless steel handlebar slider, chrome-plated seat post, and much more. For triathlete cyclists looking for a heavy-duty indoor training bike, the commercial series Fitnex X Series Velocity bike has it all. 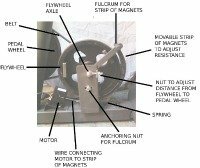 It features a 47-pound, precision machined flywheel with stainless steel axle, a long lasting leather brake pad, 1050/7 coil tension spring shock suspension under the seat, and a low maintenance belt drive. Other features of the Fitnex X Series Velocity include an anatomically designed polyurethane foam saddle with a mid-section cutaway and vinyl cover, high performance indoor cycling pedals, water bottle holder, and inline skate wheels for easy transport. 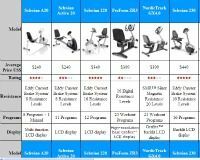 While reviewers rate it high in all categories, users especially point out the suspension system – a feature that most stationary bikes don’t offer – and the near-silent belt drive operation. This club-quality spin bike that can handle hard-core power training for every day demanding workout. The Fitnex X Series Velocity training bike has an MSRP of $1,100 but things can seem a bit tricky when shopping. We’ve seen it priced anywhere from $899 (at Amazon) with free shipping, and is currently listed for up to $1299 at other online merchants. This super quiet spin bike is a Best Buy at $1,100, but you can save a lot of money by buying it at the right time, at the right place. If you can find it for $900 or less, it is a steal!